Friends, are you ready for some next-level alfredo pasta? I know – who isn’t? Let’s do this! 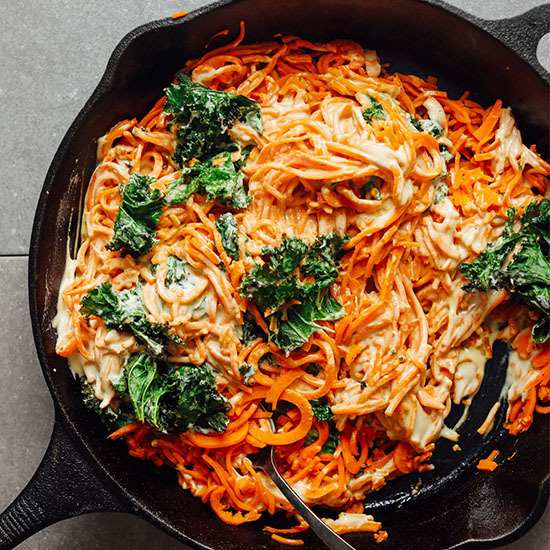 The base and inspiration for this recipe is sweet potato noodles! I’ve only shared a few veggie noodle pastas on the blog (Carrot Noodle Chickpea Bolognese, Zucchini Pasta with Lentil Sauce and Noodle-Free Pad Thai). But, because it’s summer and I’ve found myself in an abundance of zucchini and potatoes, it seemed like the right time to share another “pasta-free” pasta dish! This recipe is easy to make, requiring just 8 ingredients and simple methods to prepare. 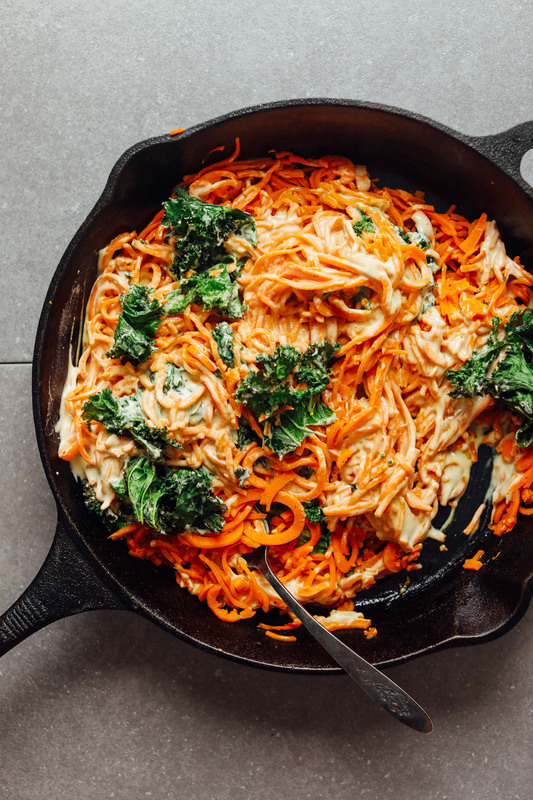 The base is spiralized sweet potato noodles, which cook up quickly until tender and provide the perfect amount of sweetness to offset the garlicky, cheesy cashew alfredo sauce. This garlicky alfredo sauce is on point! Cashews blend with garlic, nutritional yeast, salt, and almond milk. Arrowroot adds a little more thickness to the sauce but isn’t necessary. Yes, that’s it! So easy and so creamy, garlicky, and delicious. Look at that thickness though! This would make the perfect weeknight meal when you’re craving something healthy but satisfying. If you aren’t into sweet potatoes, you could sub other veggie noodles such as zucchini or your favorite gluten-free pasta. And if you’re into pasta, be sure to check out our Spicy Red Lentil Pasta, Chickpea Bolognese, Garlicky White Wine Pasta with Brussels Sprouts, Eggplant Lasagna Roll-Ups, and Roasted Red Pepper Pasta. *Recipe updated 6/6/18 to speed cook time and improve method for cooking sweet potatoes! Add cashews to a small mixing bowl and cover with very hot water to soak for 30 minutes. Then drain thoroughly and set aside. (Or soak cashews overnight or 6-8 hours in cool water). If serving with kale chips or sautéed kale (or crispy chickpeas), prepare now and set aside until serving. While cashews finish soaking, peel and spiralize potatoes using a veggie spiralizer on the thinnest blade. 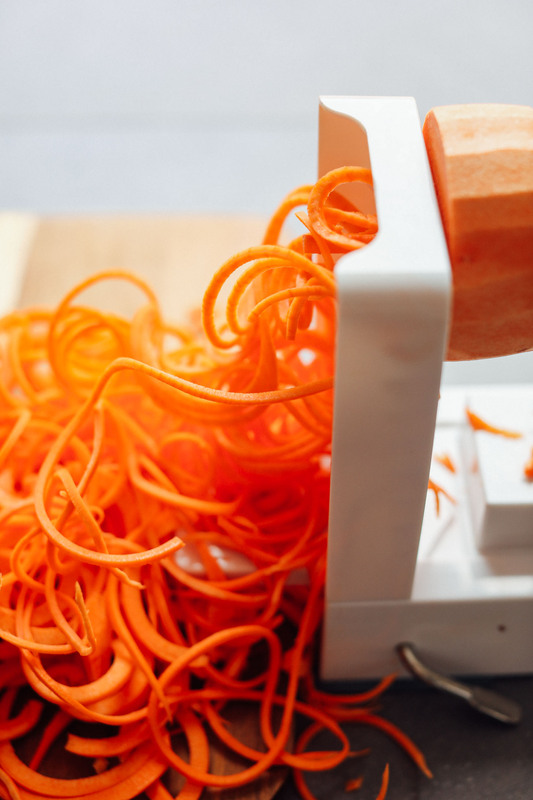 Or if you don't own a spiralizer, you can use a vegetable peeler or julienne peeler instead. Set aside. Add soaked and drained cashews to a high-speed blender. Then add remaining ingredients: garlic, nutritional yeast, salt, arrowroot starch, and almond or rice milk. Blend on high until creamy and smooth, scraping down sides as needed. Taste and adjust flavor as needed, adding more garlic for zing/kick, nutritional yeast for "cheesiness," salt for saltiness, or a pinch of red pepper flake (optional) for heat. The sauce should be creamy, smooth, and pourable. If too thick, thin with a bit more almond milk. Transfer sauce to a large, rimmed pan or pot and heat over medium-low heat until it just starts to bubble. Whisk as it heats, as it will thicken. Once bubbling reduce heat to a very low simmer to keep warm. The sauce will thicken, so thin with more almond or rice milk as needed. Add 1 inch water to a large pot and top with a steamer basket (if you don't have a steamer basket, see notes). Heat over medium-high heat and once bubbling, add potato noodles. Cover to let steam for 3-5 minutes or until al dente or a little softer (depending on taste). Be careful not to steam too long or the noodles can become soggy. Add your sweet potatoes to your sauce and gently toss to combine. If adding kale or other add-ins, add at this time. Serve as is or garnish with fresh parsley, crispy chickpeas, kale, vegan parmesan, or red pepper flake (optional). This dish is best when fresh, as the noodles tend to get soggy after reheating, but the flavor is still delicious! If storing for later, I recommend keeping kale and other toppings separate. Will keep in the refrigerator for 3 days. Reheat on the stovetop or microwave. *If you don't have a steamer basket, sauté sweet potato noodles in a bit of oil in a large rimmed skillet for 5-7 minutes, gently stirring / tossing until al dente or slightly more done (to taste). This method can be a little trickier to master as steaming is more controlled and even heat. But it still works! *To save time you can also buy store-bought spiralized sweet potato noodles. *Nutrition information is a rough estimate calculated without optional toppings or garnishes. *I prefer the above linked spiralizer by Inspiralized. But this Spiralizer looks great, too! Although I’ve NEVER had a failed Minimalist Baker recipe before, honestly, I was sceptical about making sweet potato noodles. I imagined they would be either raw or mush. However, I finally tried making this dish and it has got to be one of my FAVOURITES!!! My family loved it too. To any fellow readers/sceptics, MAKE THIS DISH TONIGHT!!! Whoop! So glad you liked it, Hanna! Thanks for the lovely review! This was delicious! Love the sweet potatoes as pasta! I will make a double batch of chickpeas next time. I adjusted the seasoning in the cheesy sauce to make it not taste too much like nutritional yeast. I also added some lemon juice in it. Thanks for the share! Hi, it’s quite possible I just missed it in the directions, but I still can’t find what to do with the oil. However, made it last night (without oil) and we really enjoyed the faux alfredo. Can see many applications for it. Great question! We actually updated the method for cooking the sweet potato noodles, which is why there was a discrepancy. We just amended that so it should now be accurate. Thanks for catching this and glad to hear you enjoyed the recipe! Hi, what do I do with the 1-2 T oil under Noodles? Thanks. Hi Maggie! I’m not sure I understand your question. Can you clarify so I can help you? Thanks! Seems like the other sauce recipe was too garlicky for people but I made the new sauce and I found it to be not that flavorful :/ (also was my first vegan “cheesey” sauce) had to add in a lot more spices to make it tastier. I’m so confused… I’ve made this several times and if I remember correctly, it used to have a full head roasted garlic and the noodles were sautéed in oil, not steamed. Did you change the recipe? I wanted to make the recipe I loved and enjoyed so much again, but now I’m wondering if I’m forgetting anything else! I’m leaving a rating but it’s for the old recipe that I loved so dearly. Would you be able to send it to me-I didn’t save it externally as I thought it would always be on the website! Hi Dee! We did update this recipe on 6/6/18 to speed cook time and improve method for cooking sweet potatoes! We hope you enjoy the new + improved version! It was okay! One of those meals where you eat it once and that’s enough you’re already getting sick of it by the time you finished. The recipe makes a lot of sauce and keep in mind it’s a lot of calories with those cashews if you’re eating a lot of sauce. Oh, I simplified it because it wasn’t necessary and a little time consuming. But if you’d like, roast a whole head of garlic and add it to your sauce! Hello there, I just had a quick question, can you use soy milk instead of rice or almond milk? Amazing!! I subbed 50/50 canned coconut milk and water because I forgot to get almond milk, and it worked fine. Added a splash of lemon juice to the sauce for a bit of acidity. Husband practically licked the bowl. Will go in our regular rotation for sure. I was skeptical at first but it was surprisingly delicious & simple to make. Indulgent but healthy & I’m impressed! Is there supposed to be roasted garlic in the sauce? It seems so from the comments and reviews but I don’t see roasted garlic on the ingredients list… am I blind? Hi Lena! The ingredient list calls for fresh garlic, but you can roast it which takes the edge off of the garlic flavor and makes it sweeter. Thank you for the reply. I did 3 cloves raw garlic AND a whole head of roasted garlic lol. It was great. Will make this recipe again for sure. Yay! Glad to hear it, Lena! Overall this was definitely yummy, but I think my technique for cooking the sweet potatoes needed improvement (otherwise it may have been 5 stars!). I don’t have a steamer so I tried to sauté the sweet potatoes, which may have been overly ambitious since you mention it’s hard to master! I think listing a measurement for oil for this method would be helpful – I ended up adding a few tablespoons of water to help with the cooking of it, trying to avoid too much oil. It went alright, but some noodles got burnt while others tasted undercooked. The sauce was SO good though (I was literally licking off the spoon before I even mixed it with the sweet potatoes…). I’m glad I have a lot leftover from this recipe – I want to try throwing it on other veggies/pasta! I’ve never posted a recipe comment before in my years of cooking but this dish just CHANGED. MY. LIFE. 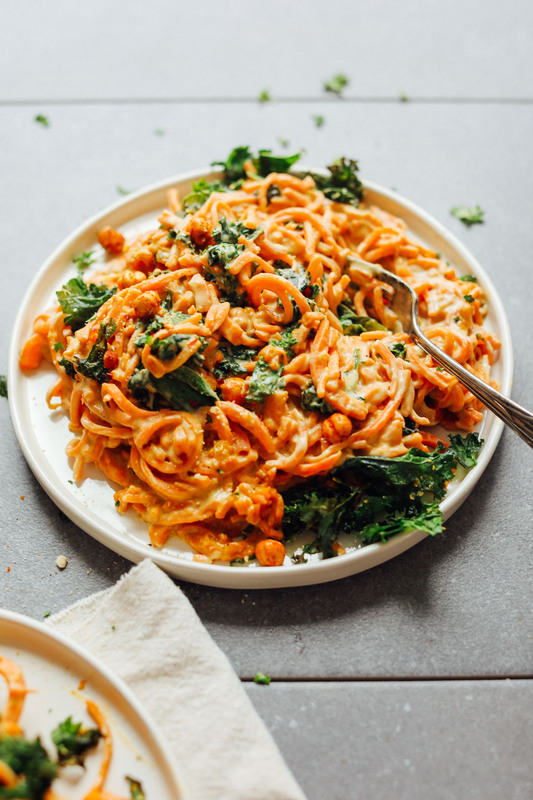 I had it with sweet potato ribbons, sauteed kale and the chickpeas and wow, it’s lick the bowl good. 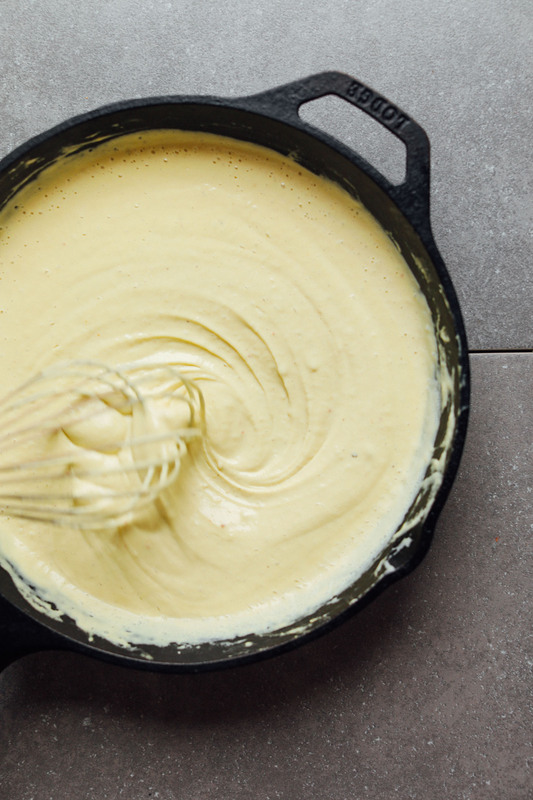 I subbed the plain almond milk for half vanilla cashew milk and half aquafaba, the hint of vanilla gave the sauce a little sweetness and depth. Also threw some chili powder in for a little kick. Will be making this again and again, thank you! This was super delicious! My spiralizer quit on me while trying to make the sweet potato noodles soo I threw it in the trash and luckily had some rice noodles on hand! The extra punch of garlic with the non-roasted cloves was much appreciated. Definitely a must-try recipe and I will be making this frequently! Love this recipe so much! I made it nearly as written except I added more of the raw garlic. Thank you for this delightfully different dish. Unfortunately, found the sweet potato noodles to be almost sickly-sweet for my taste (and I generally have a sweet tooth). I ended up tossing most of the sweet potatoes and substituting regular pasta. But the sauce was yummy, and your topping suggestions (the kale and the chickpeas) were delicious. I might try this again but using zucchini noodles or something instead — in my experience, they give a much better texture & flavor than the sweet potatoes did. This dish is amazing! I added suateed spinach at the end. Delicious! Hi! Unfortunately I do not have a food processor. Is there a sauce that I could buy that you would recommend? Do you have a blender you could use? It says high speed blender but will a food processor work? Not really sure what the differences are. Yes, a food processor will work! Such a bummer that this did not turn out better. The sauce was good, but my potatoes wouldn’t soften so it just tasted raw and had an unappetizing mouth feel. It’d be helpful to know how long one is supposed to cook the potatoes. Also….too many cooking components (spiralizer, oven, two pots, a food processor, bowls). Not really a “simple” meal when you think about the time it takes to clean up after it’s all said and done. Hi Lauren! thanks for the feedback. I’m sorry about the sweet potatoes not being tender. I added a cooking time range in there so it’s a bit more specific and easy to follow. Next time, before adding them to the sauce take a bite of one to see if it’s tender enough for your liking. As for the recipe, yes the equipment is a little more involved, but we kept the ingredients to a minimum (8 total) to keep the simple in this way. Thanks for sharing your experience! Just finished making this, and WOW. I’m officially obsessed ?. Thanks for the recipe! Will be using this cashew chz recipe for so many more things! The sauce is magical! I would happily pour it over just about anything, but the sweet potato and kale combination makes for a particularly satisfying meal. I’m a garlic fiend and will likely roast two whole heads of garlic next time, but I will DEFINITELY be making this again. Yours is the first website I look to for recipe inspiration, and I zealously recommend you to friends and family all the time. Thanks to you both for the fantastic food, the beautifully composed photos, the general loveliness of your website, and the example you’ve set for others by following your dreams! Keep the magical food coming! This recipe had all the right flavors. Definitely recommend a high speed blender for this to achieve super creamy cheese-like sauce(used a vitamix). Sauteed in spinach at the end, roasted red onion and topped it with fresh basil. Also, only used one large head of roasted garlic, loveeeee. Thanks for sharing, your recipes are always inspiring! I’m about halfway through the whole30 and I was THIS close to calling it quits till I found this dish tonight and made it. LIFECHANGING. It is so delicious I may never eat regular Alfredo again! I subbed cashew milk for almond milk and it’s a dream. Thank you, thank you! Hi Hayley! While we haven’t tried freezing the sauce and can’t say for sure, I think it would work okay! If you give it a try, let us know how you make out. Made this for a dinner with friends we are doing a cleanse with, and we all LOVED it. We are huge garlic fans, so we loved how the “cheesy” sauce tasted (plus it gets toned down a little once you mix it in with the sweet potatoes and adds a great balance). We also added sauteed broccoli and it was the perfect combination. You offered such great direction in terms of advising how to adjust the taste if necessary, so thank you for the helpful instructions! Love love love having refined sugar-free/vegan/GF options now, can’t wait to try all of your recipes! can i use peanuts instead of cashews? Hmm we have not tried and can’t say for sure, but if you give it a try, report back on how it goes! Can roasted cashews be used or only raw? Hi Tracy! Raw cashews are needed, as that is what makes it creamy! Happy Cooking! Just wondering what is the difference between arrowroot starch and corn starch in terms of thickening properties? Will corn starch be a suitable substitute? Absolutely love your blog/recipes by the way, so many winners!! Thanks so much! Hi! You can use cornstarch! Love the recipe but made black bean pasta instead of the spiralized sweet potatoes which ended up being very (if not too) filling. I got a little anxious on roasting the garlic, so this was very garlicky but I will definitely make this again. I added 1 cup of rice milk but I think 1.5 cups would make a better ratio. This sauce went very far and adding some sautéed kale was a good suggestion. If anyone is missing Alfredo sauce this is a perfect alternative. This was delicious! I accidentally used unsweetened vanilla almond milk, and I could definitely taste the vanilla, but it was still good. I know it will be even better next time when I make it with plain almond milk :) Unlike a few other reviewers, I don’t think this was too garlicky at all, and I used three raw cloves in addition to the roasted garlic. Thanks for the great recipe! Does this sauce have a cheese-y taste even with the least amount of nutritional yeast recommended? Or is there an alternative to nutritional yeast? I really don’t like the taste of cheese at all. I made the regular alfredo sauce recently, and it was good but too cheesy for me. Hi Gabrielle! You can leave it out! Making round 2 of this sauce! So dang good and easy to eat all week! Thanks for sharing. This recipe was so divine! The sauce is so simple and yet so flavorful from the roasted garlic. I was short on time and didn’t read through the recipe before starting it (oops) so I only was able to let the cashews soak and the garlic roast for about 40 mins but luckily it still turned out nice and smooth! The 40 mins while they were soaking was prefect to get the sweet potatoes prepped and spiralized, and I also got some broccolini prepped and steamed as well. If you don’t have kale, broccoli/broccolini was a great swap, tasted like broccoli-cheddar soup flavors! All in all this dinner was delicious and I can’t wait to have the leftovers! I wanted to make this on Monday but didn’t have enough time to do it so instead I sauteed shredded sweet potatoes with a few shallots and mini sweet peppers. Then I added kale and, here’s the important part: the remainder of your macadamian nut cheese (mixed with a little almond milk) that I had made to accompany your easy vegan g-f biscuits I had made the day before. It was great!!! I love ALL your recipes. It was fun to mix a few up a bit! This is a fantastic, creative recipe. However – I found the sauce to be quite bland. I love garlic and added the amount as listed but the almond milk seemed to wash out the taste of the garlic. I’m not vegan so I added bleu cheese crumble, garlic hummus, chili pepper flakes to the sauce. I then added a bleu cheese drizzle to the finished product. I think I’ll experiment some more with this to make it truly savoury. I used all the garlic as mentioned because we LOVE garlic. But it was WAAAAAY too garlickly – which I was super surprised by. We had fresh garlic from the farmer’s market – I don’t know if that is why? But if I were to do this over I would definitely only use half the garlic recommended here. Additionally, we have an old school hand spiralizer and it does NOT take kindly to potatoes. So then we had to do it all by hand, which took a VERY long time. And finally, the potatoes took a very long time to cook and they came out uneven – some were mushy some weren’t. I stirred them often. My mom and I made this recipe this past weekend and it is DELICIOUS!! We used one clove of roasted garlic and the recipe was just the right amount of garlicky. The sauce is great and would be good on other veggie noodles or pasta. I have to admit, I don’t usually like cashew-based sauces; however I decided to give this one a try. I’m so glad I did because it is phenomenal! I used 1 sweet potato and a bunch of steamed kale with the sauce and it was delicious! It will definitely be on the rotation!!! Thank you so much! Mae this last week and it was such a huge hit. Top of the favourites list now. Thank you for the recipe. I made this dish for some friends last night, and it termed out really well. I added a red pepper and a whole head of kale. We included all of the “for serving” optional items to fill our bellies more. Super delicious! I would make this again in a heart beat, but I would reduce the amount of raw garlic I used (2 large cloves to 1 clove). Will tapioca starch work in replacement of arrowroot or cornstarch? OMG. I knew as soon as I saw this recipe that I had to try it, as a lover of sweet potatoes, garlic, and alfredo. Well, I just made it and it is somehow even better than I expected! I topped with crispy kale and red pepper flake. Also, I had a bag of pretty small sweet potatoes, so I just spiralized and sauteed one to make the perfect meal-sized portion. I will store the rest of the sauce and do another sweet potato tomorrow so the noodles don’t get soggy. Fantastic recipe, Dana! So incredibly yummy! I’ve already made this twice (in 2 weeks) and planning it again! I didn’t have a spiralizer, so I just used my cuisanart and it was still amazing! I made this for dinner and really enjoyed it! I personally like a garlicky flavor so I used an entire head of garlic but didn’t roast it. I added the sauteed kale and red pepper flakes but skipped the chick peas. Leftovers get a little soggy, but that was okay with me. Still just as yummy. This was great! Thanks, Dana! Whipped this up for lunch today, very tasty. Didn’t have a garlic head laying around so I just added some dried sliced garlic to the mix then blended the sauce ?. Thanks for another great recipe. Made it and loved it! Does anyone know if the sauce freezes well? This looks awesome and I always love to find recipes I can bust out the spirilizer!! I’m not a huge fan of kale.. is there a replacement you would suggest? Hi! You could use collard greens! Made this tonight and loved it! One question: how long did you steam your sweet potato noodles? I did mine too long I assume because they shrunk quite a bit and started falling apart – no longer the beautiful spirals the spiralizer made – but I felt before they weren’t really “tender.” Maybe I should’ve done chunkier spirals? Hi! Next time either make them chunkier or add less water to the pan next time! We have only recently removed meat from our diets and stared trying new recipes– this one was a success! We love the fajita and stuffed pepper recipe from Minimalist Baker but this is a whole new flavor and a great addition to our meals! We were worried about the garlic– it wasn’t too much for us and was a great “zing” flavor. You will NEVER miss meat if you use Dana’s meat free, plant-based recipes! They are incredibly delicious, easy and foolproof! Welcome to living a more compassionate life. For those Canadians out there, I believe the use of “Sweet Potato” here is actually our “Yams”. Depending on where you haul from, the Food Market industry changes the names of these “vegetables” all the time. In this case, it’s not just convention. Sweet potatoes (s.p.) and yams are actually two different vegetables. They cook differently, so it’s good to know which is which. Here in the U.S. stores do sometimes incorrectly label s.p.’s as yams, but have been getting better about that in recent years. 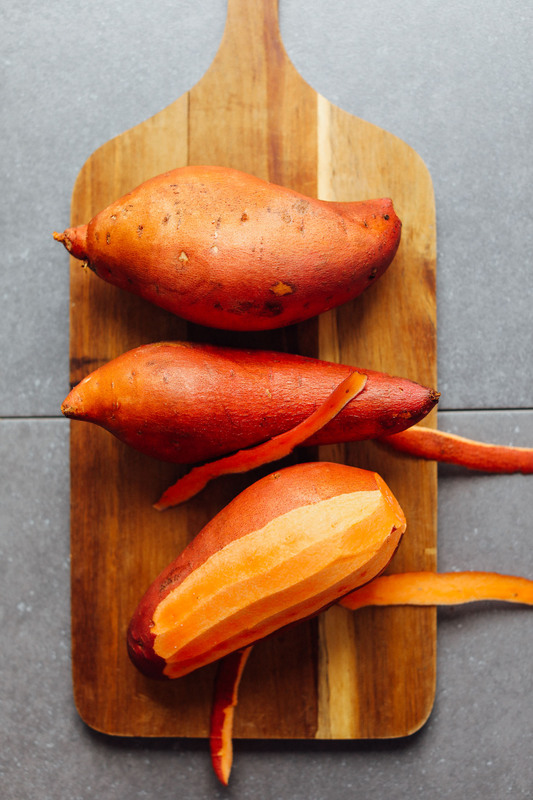 Yams have thicker skin (they need to be peeled), and are starchier so they need more oil, cream or butter to cook. Healthwise, they’re good for you. S.p.’s are sweeter tasting, but lower in calories and less starchy. That means you can steam or roast them and serve w/ less oil etc. added. You can eat the skin of a well-scrubbed s.p., and that only adds to the health benefits. I absolutely love s.p. hash done by cubing unpeeled s.p.’s and steaming in the microwave (just cook covered loosely with soaked paper towels under) for 2-3 mins while letting onions, peppers, celery, etc. sauté in a pan with just a bit of butter and olive oil. Then pop in the steamed s.p.’s and add garlic, paprika (I use smoked), salt and pepper to taste. Adding chopped jicama or a bit of tart apple in to cook with the s.p. works great with this (also chopped pecans) and it works as an easy, healthy side or main dish any time of day -great with a simple spinach salad! The recipe looks great. Can’t wait to try. I was wondering if you had ever experimented with kelp noodles. I had an amazing dish with them at a restaurant in Miami, with a cashew peppercorn sauce. I would love to see your take on kelp noodles! This was just as delicious as you promised! I added broccoli to the mix (because that’s what I had on hand) and we really liked it! I think I should have started the broccoli first instead of putting it in at the same time as the potatoes – it took a little longer to cook and so the noodles were a bit mushy, but still yummy. QUESTION: we had extra sauce – I refrigerated it – do you think it will keep? Is there another recipe you use it with? I have some ideas, but just asking. I am a new fan of your blog and thank you so much for all you do to make it easy and enticing to cook vegan/vegetarian meals! Hi Mary! The sauce should keep, you could try the sauce on other pastas! It’s tbsp. The yeast is a big component of the sauce because it adds the cheesy flavor. This is a wonderful recipe, Dana! I’m a garlic lover, so this sauce was right on the money for me. It’s inspired me to incorporate more roasted garlic in my cooking. I don’t have a vegetable spiralizer, so I just chopped up sweet potato and roasted it in the oven along with the chickpeas. Thank you for your innovation. This is truly the BEST SAUCE EVER! Wow, wow, wow. Just made this. I’m actually peaking right now, so I’m writing from a cloud. And I’m soo, sooo high from the flavor and this PERFECT combination of the right stuff. Thank you so kindly! I can’t even! My partner and I are both plant-based educators, and recommend your site so much because it’s truly a rare gem. We’re so grateful to have you as an adjunct teacher! You have made best use of the opportunity to reach out the masses. Many, many blessings! Hi ! I’m roasting the garlic now and will make for dinner tonight. How do I store the garlic until tonight ???? Refrigerator??? Keep in foil? Or pop the garlic out and then store in frodge ? Made this last night and thought it was really good. Omitted the raw garlic per the reviews and missed having it there, haha. Next time I’ll make it before tweaking it as I should have! Loved this recipe! I didn’t have raw cashews laying around so I ended up using raw walnuts and soaking them instead. Probably a different flavor, but tasted pretty good! Hi! There really isn’t an alternative so you can just leave it out! Don’t have nutritional yeast…any creative substitutes I could try? I decided to finally buy a spiralizer because I had to try this! So good! It was also my first time roasting garlic, and I thought the flavors were perfect. I am drooling!! We are moving and my Vitamix is in a storage box until we can move into our house… Our temporary corporate housing’s kitchen supplies are *a-hem* limited to say the least. So alas, it will have to wait:( But I am pinning this to make asap!!! YUM! Very good. Different. The sauce is out of this world. I find sweet potatoes to be a bit too sweet, so the kale and spicy garbanzos help balance that. I absolutely love the sound of this recipe and can’t wait to try it! You are absolutely my number one, most favorite vegan blogger of all. I love your creative, delicious, recipes and how quick and easy they are to put together. Thank you for sharing your talents! I recently stalked up on roasted lightly salted cashews. Would this work or should I stick with raw cashews for the sauce? Hi! You need raw cashews for this recipe! I have totally used roasted/salted cashews in similar sauces before (though not this one specifically) and had it work fine, just don’t skimp on the soaking time, and taste it before adding in any additional salt. 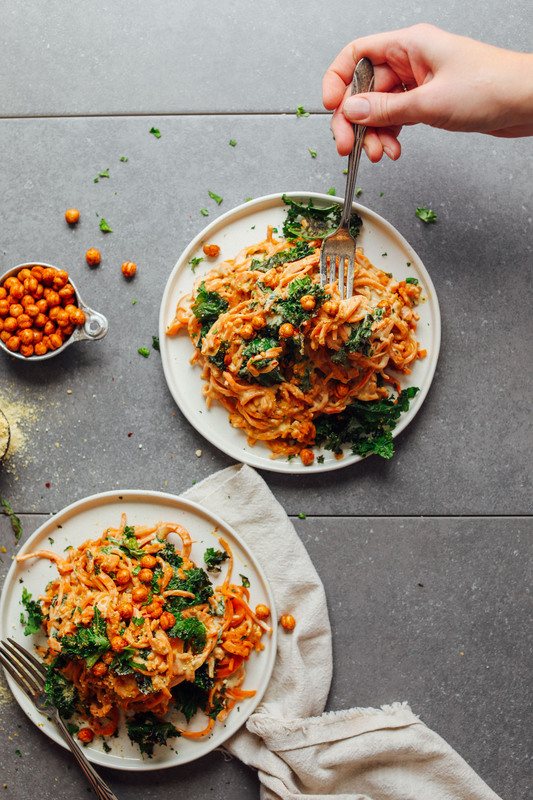 I think the cashew flavor tends to be a little more pronounced when using the roasted kind, but honestly I think the garlic would disguise that in this recipe..
Actually though I have a question – I don’t have a spiraliser, but for your chickpea bolognese recipe, the carrot noodles are done by long peels. Do you think that strategy would work well here? So penciling this in next time sweet potatoes are on sale! This was really tasty! I’m not sure I’d make it again without a spiralizer, though, I spent an hour peeling the sweet potatoes into ribbons along with the rest of the prep that went into this. We had it with the crispy chickpeas and kale (I just roasted it for the last five minutes of the chickpeas). Very good and flavourful! This recipe has single-handedly convinced me that I can handle going “healthy” – this is THE MOST DELICIOUS THING I’ve had in forever!! I cannot believe how stupid addictive this is, I’m actually considering making an entire second plate! Thank you so much for this recipe, you seriously might have just changed my life, I’m so excited to try more of your recipes! Do! They are brilliant and creative and foolproof! Whoa, was this lick-the-bowl good! I used a whole head of roasted garlic (yum) and that was plenty delish for us. My only regret was not roasting the kale beforehand…by the time I taste-tested the sauce I just couldn’t wait. Made this recipe tonight, it was soooo delicious. We only put 4 cloves of garlic and it was garlic-y enough for us!! Thanks Camilia! So glad you enjoyed it. Next time can you please leave a rating? It’s super helpful for us and other readers! I made this tonight and just a heads up it has a REALLY overpowering garlic flavor if you use the full head + 2 cloves. If I were to make it again, I would only use 2 cloves total I think. I like garlic but this was too much for me! Thanks for the feedback, Cat. Did you roast the full head of garlic as I suggested? Roasting garlic definitely takes the edge off of the garlic flavor and makes it sweeter, which is why I still added two cloves fresh garlic to the sauce. The end result was delicious, and the flavor wasn’t overwhelming for me for me. Also, I called this recipe “Garlicky” Sweet Potato Noodle Pasta to best communicate the flavor. Perhaps next time – as you suggested – reducing the raw or roasted garlic would be helpful for you. The whole family (even the baby!) LOVED this! Yum yum!! Thanks Meagan! So glad you enjoyed it. Next time can you please leave a rating? It’s super helpful for us and other readers! Hi Dana, first of all compliments for all your recipes, I litterally adore all of them. Unfortunately, only English speakers have the chance to enjoy them and I know for sure that many Italians would be more than willing to try them. I’d like to open the doors of your kitchen to my compatriota so I’d like to translate them into Italian, for free of course! If you think the idea might like you, let me know how to contact you. Hi! Love your page and have made so many of your recipes. If I wanted to use actual cheese, could I just omit the nutritional yeast? I would still add it for flavor, personally. But let me know what you try! How do these hold up as leftovers? Wondering if I could make them tonight and pack leftovers for my kid’s lunch tomorrow. I tried it twice, once with the yeast and once without it–to be honest it was pretty similar each time. I think the most important aspect of the recipe is not overcooking the noodles. This looks wonderful!! Will cows milk work fine, as well? Thanks!! What if ok don’t have a spiralizer! Spiralized sweet potatoes are wonderful, but I have a feeling that this cashew sauce would be delicious on anything. Heck, I’m tempted to just throw it on a salad when it gets to hot to turn on the stove! Can’t wait to try this!! Thank you for all your great recipes. I’m currently hooked on your quinoa taco meat! I’ve made 2 batches this week! No more veggie ground beef from Trader Joe’s for me? If I only have roasted unsalted cashews, will they still work? I’m not sure, but I only always use raw. Great recipie! Is there a spiralizer yoi prefer/recommend? I link to two above! These noodles are an incredible idea as I hate pasta but what can I substitute nuts with?? It wouldn’t be exactly the same, but I think northern beans would work to replace the cashews. Use canned and skip the soaking process. Maybe with some boiled /roasted cauliflower!!!???? This looks amazing! I totally need to try this the next time we have sweet potatoes in the house! This looks great! My husband kicked the carbs out of his life, so we don’t really eat pasta anymore. Love to make food outside the box! The use of veggies as pasta feels like clean eating, with extra veg and yummy sauce to go bathe it in! Mmm… Gotta LOVE it! I really appreciate your blog and for being a go to reference for the nights that I have no idea what to cook. Thank you for all your efforts! So kind – thanks Jeanne! Sorry, but sweet potatoes are full of carbs! Thanks! I’ll just sub zucchini/yellow squash. It’s a new path for us. Good, complex carbs, yes. So you better eat them.